We are so glad that you are considering us to be your church home! Bro. Russell has been at Victory Baptist as our Pastor for 18 years. He married his wife, Lora, in August of 1984 and have two Children, Elizabeth and Logan. Elizabeth married Michael Hoots in 2008 and have two children. Logan married Cheyene in 2013 and have one daughter. Bro. Russell was saved under the ministry of the Roloff Homes for Men in Corpus Christi, Texas. He grew spiritually and the Lord used him in leadership at the Roloff homes as the Dean of Men. In 1990, the White Family moved to Decatur, Texas under the Pastorate of Monty Martin as the Youth Director. In 1994, the Lord led Bro. 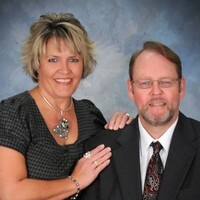 Russell and his family to take the pastorate of Bible Baptist Church in Breckenridge Texas. They served faithfully there for 3 years. In 1997 Bro. Larry White (Bro. Russell's dad) was called from Victory Baptist in Stephenville to a church in Snyder Texas. Our church felt lead to offer the opening to Bro. Russell. After much prayer and leading of the Lord, Bro. Russell moved his family from Breckenridge to Stephenville. During the past 18 years the Lord has allowed him to lead us in building a new church building just outside of town on Pigeon Road. In 2004 he completed his Master of Theology degree from Andersonville Theological Seminary. Our church has grown numerically and Spiritually under the leadership of this family. We are proud to call Russell White our Pastor.